The master bedroom suite in this 3BR/3BA handcrafted home is the perfect spot for a relaxing vacation, with lots of privacy and independence in your home away from home! The suite is the only guest room offered. It is in the north wing of the home, separated from the owner's wing by the living room, dining area and kitchen. The owner is single, quiet, and has 1 small (non-barky) dog, and enjoys sharing the joy and beauty of the home and Maui with guests.The owner respects your privacy, giving you as much or as little interaction as you prefer while you share the space. The home has all the amenities you need for a relaxing, peaceful stay. It's located in the desirable Launiupoko district, about 5 minutes to downtown Lahaina by car, and its easy to bike or hike all around the surrounding area. This Plantation era-inspired home has teak floors, comfortable furnishings, an amazing oceanside lanai for relaxing and dining, and a wonderful outdoor hot tub with amazing views in all directions. The Master bedroom suite has a king bed, an extra large dressing room/closet, and a Bali-style bathroom, finished with teak and stone. The step-in shower is huge and has 2 showerheads. The bedroom has a dresser, a comfortable love seat, and a TV with premium cable channels. A glass sliding door steps right out to the huge ocean view lanai, where there is a dining table and a lounging area. You have access to the common kitchen and living areas. We love this neighborhood! The spacious lots, the amazing views, the peace and quiet - these are the elements of our Maui Shangri-La. We are excited to be able to share this very special property with you. The property has amazing unobstructed views. The neighborhood is very upscale, and this house is a super value-oriented offering compared to the mansions surrounding it! This is a vacation spot for 'real people' looking for serenity and relaxation. It is best suited for independent minded travelers. Please check the guest comments to see how many people have loved it here over the years. The neighborhood has a 7 mile running and walking trail to which the home offers easy access. It's so easy to visit all of Maui from this location. It's about 2 miles to Lahaina, so having an elegant dinner in Lahaina is as easy as can be. The Bali inspired master bath is en suite and has stone and glass block shower with 2 shower heads, a double vanity, and a toilet in it's own enclosure. Available in the master suite for a daily surcharge of $10/day. If you wanted to A/C the entire home, it would be $20/day. A wide variety of condiments and oils are available in the kitchen. I provide juice, coffee, tea and cocoa for morning enjoyment. Kitchen space is set aside for you, and you are welcome to prepare your own meals. But please don't plan on having every meal 'in'. Get out and enjoy Maui's amazing culinary offerings. iPod dock and CD boom box in the suite. Jan and her adorable dog, Kiwi, share their perfect home so you can completely relax and recharge. The location is central to Lahaina and we feel, the best area of the island. The master suite was amazing and we found that we rushed "home" every night to sit on the porch that overlooked the ocean, and gave us glorious sunsets. Jan's home is very comfortable and she shares lots of staples, as well as fruit from her trees to make your visit spectacular! She even shares beach chairs, umbrella, coolers, ice packs, boogie boards and a pool noodle that made our trips to the beach so comfortable. Jan was also a great source of information on what to do, where to go and who to rent from. She has done all the research so you don't have to! We've been home one week from our 10 day stay with her, and every day since have said how much we enjoyed our stay with Jan and Kiwi. If we were to visit again we wouldn't hesitate to stay with them! What a view from front to back on beautiful 6 acres. Jan has a beautiful Plantation home on 6 acres with beautiful landscaping and really makes you feel you are in paradise. We loved our stay there and walking up to those amazing views on the Lana’i. Jan was a pleasure to share her home with us and loved playing with Kiwi her adorable and loving dog. Thanks for the memories and Aloha!!! Everything we expected, and more! Our mid-May experience of paradise was nothing short of spectacular, and this vacation rental was the perfect place to call "home" for a week. If you're thinking of coming to Maui, and you want to stay on the Western side of the island, book this place, you won't regret it! We absolutely loved our stay in the most beautiful home on Maui! Jan is awesome!! As well as her little dog Kiwi!! We will be back!! Thank you so much for everything Jan!! You are the best!! Wy wife and I celebrated our 20th anniversary with a stay at Jan's place and we had an amazing time. Jan was great - as well as her dog Kiwi. Everything was top notch and Jan is incredibly knowledgeable about Maui as well. We hope to come back. So relaxing, so quiet, such a helpful hostess. Everything was so clean, so quiet, so relaxing. Hostess was so helpful and friendly. Loved everything about it. Wish we were still there. Miss it so much. Located in a private neighborhood on a hill near historic Lahaina and the resorts of Ka'anapali, this lovely plantation style home on 6 acres offers huge views, and is a wonderful place to really relax and unwind. The location provides easy access to all of Maui. 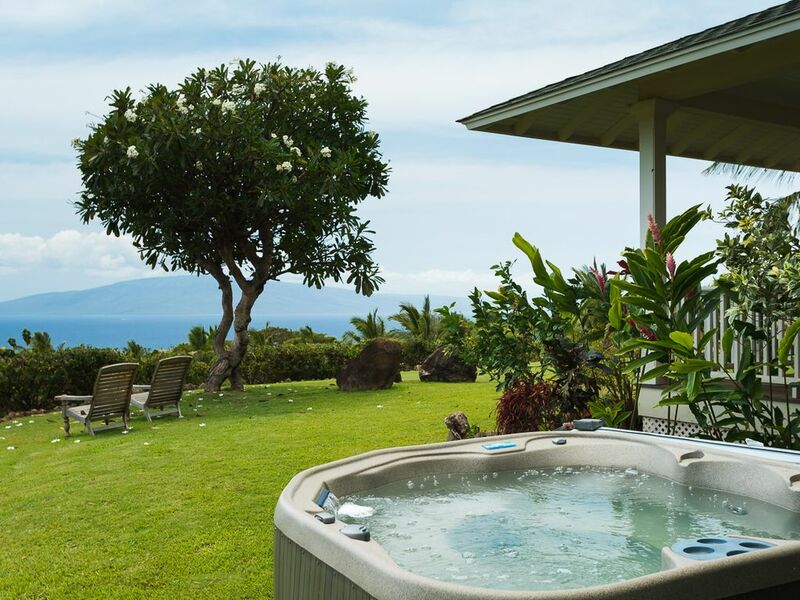 It's a private sanctuary with amazing views and a rural feeling while offering easy access to town and all the best activities of Maui. The home has all the furnishings and equipment you need to be at home here, to relax deeply and enjoy the good life. All cancellations are subject to a $50 cancellation fee. If you cancel 60 days or more prior to your trip, I issue a full refund minus the fee. For holiday season reservations (involving dates between Dec 20th and Jan 5th), the no-refund cancellation window is 120 days, or 4 months out instead of 2 months out. The refund will not include VRBO/HA or PayPal fees, if you elected that form of payment, as I am not a recipient of those fees. If you cancel within 60 days of your arrival date (or 120 days if it’s a holiday season reservation), the refund is based on my ability to fill your reserved dates. I will refund you as many of your reserved dates as I am able to fill at the rate I am able to negotiate, minus the fee. Your reservation serves as a binding contract between us – me to provide the lodging and you to abide by the cancellation policy.